Staff is at work on the 2005 book. Onekama High School senior Erica Jach, former editor of the high school yearbook Jiigabiik, display the prestigious Spartan award recently earned by the yearbooks 2003-2004 edition. 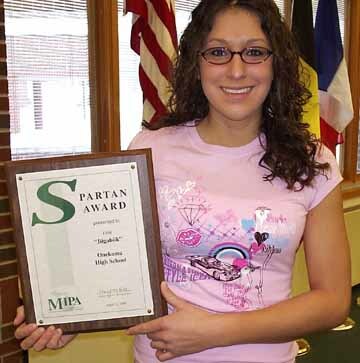 Each year, Michigan State University gives the Spartan Award to those high school yearbooks, which meet or exceed journalistic qualities put forth by the universitys School of Journalism. Onekama High Schools yearbook has received the Spartan Award for five of the last six years, with a staff comprised of one class of 9th through 12th graders. Teacher/librarian Debra French has served as adviser to Onekamas Jiigabiik staff for the past five years.